The 2016 model refresh of the mega-selling Honda Accord will have an aluminum hood and offer optional autobraking and other safety features poised to reduce crashes, Honda said Tuesday in new developments worth examining by collision repairers. The hood cuts 18 pounds of weight from the new model compared to the 2015 Accord, spokeswoman Jessica Howell wrote in an email. “Taking weight out of the front end in this way contributed to improved handling feel and response,” she wrote. It also of course requires a little more effort by collision repairers and paintless dent removers to smooth out dings and dents, and Honda notes that some fasteners are one-time-use only because of the possibility of galvanic corrosion. Though they’re not doing a major structural update yet, Honda has increased the rigidity of the bulkhead and shock tower bar on all Accords. Also, all the model versions except the LX have new front upper member and front and rear damper housing stiffeners as well as a new center tunnel brace. “The more rigid body combines with numerous chassis upgrades – including higher performance dampers, retuned electric power steering and, on Touring models, new Amplitude Reactive Dampers and hydraulic subframe bushings – to deliver even more responsive steering and handling together with a more refined ride quality,” Howell wrote. The 2016 Accord will have a variety of gizmos offered to not only reduce future crashes but also make repairs a little more complicated with the new sensors, etc. For example, some of the technology might, depending on the repair, need a dealership to provide the tools to correctly “aim” it. 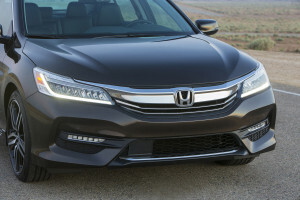 The Honda Sensing option ranges in price from about $1,000-$2,000 for most of the 2016 Accords, but comes standard on all the Touring versions of the Accord. It’s unclear what proportion of the 388,000 Accords sold last year were Touring versions. Sensing includes autobraking, lane assist, and other features which have already been shown to reduce the number of crashes — particularly as they work during the most common crash scenarios and speeds. That’s a problem for collision repairer revenue, even if the average repair cost increases when you do get them in your shop because of the necessity of OEM technology and the more expensive sensors which can be damaged in crashes. Plus, Honda’s technology seems to be at a price point attractive to buyers. In April, a J.D. Power study found consumers’ top 5 car tech wishes included automatic braking, blind spot checking and collision prevention, a rear-view camera instead of a mirror, and night vision dash displays. It also found customers willing to spend between $2,067 and $3,703 on vehicle technology, depending on age.